This page offers the minutes of the Tiree Transport Forum, since Feb 2018, and any other document /report related to Tiree transport issues. The Feb meeting covered a raft of transport issues. This meeting was a CalMac exclusive ‘summit meeting‘ which had been delayed since early summer, following the Clansman’s extended withdrawal from Tiree service. This meeting mainly discussed the GLW-Tiree Air PSO with Michael Bratcher,Aviation Policy, Transport Scotland , and some ferry issues following the 10 Oct Meeting with Calmac, including the subsequent advice, below, re the deployment of the Clansman away from Tiree into the UIG triangle, whilst the Hebrides is in dry-dock . Following extensive consideration, I can advise that we intend responding to customer requests to improve resilience on the Uig triangle during the refit period. We will do this by deploying the MV Clansman instead of MVs Isle of Arran and Hebridean Isles when the MV Hebrides goes in to refit in March 2019. Planning the deployment of vessels during the winter refit period to provide services at an optimum level is always a challenge but everyone can be assured that considerable thought has gone into finding a way to get the most out of the resources available to us. The original plan for the Uig triangle was to deploy MVs Isle of Arran and Hebridean Isles when MV Hebrides was in dry dock in March 2019, however the challenges faced within the fleet have been acknowledged and a more resilient deployment plan has been created. The deployment of the MV Clansman in this way will require that MV Lord of the Isles covers Coll, Tiree and Colonsay services from Oban, and MV Isle of Arran will operate between Lochboisdale and Oban, rather than to Mallaig, where she is unable to berth. The plan assumes that all vessels complete their dry dock on schedule and that no further technical disruptions occur. We have analysed the likely capacity utilisation for this period and are confident that we can meet demand with this plan. If you require any further information, please contact your Area Operations Manager. We had a very positive, constructive meeting, openly addressing many ferry issues. 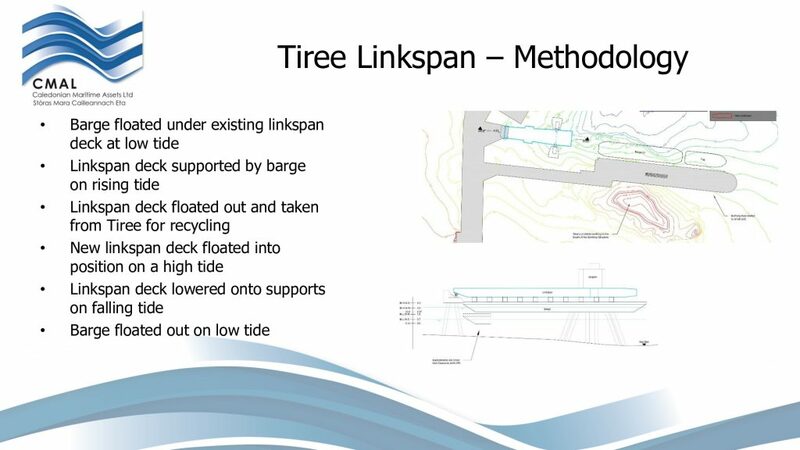 The main discussion concentrated on Tiree’s linkspan replacement. 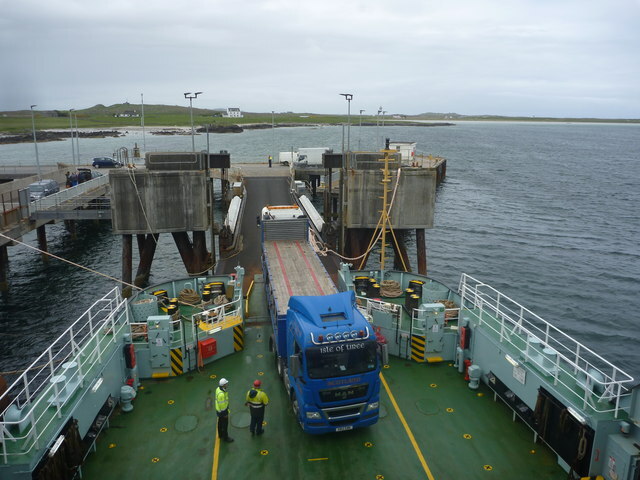 “We are planning a project to replace the linkspans at Tiree and Coll Ferry Terminals. Funding is in place and our engineering team are finalising tender evaluations for the works, with a view to appointing a contractor in the near future. It is our intention to issue a formal update once a contractor is appointed and to consult with the communities in Tiree & Coll at meetings in December 2018, which we are in the process of arranging. At the meetings CMAL & CalMac will discuss the timing of the construction project, the details of the replacement process and the alternative ferry services to be in place during the works. While the programme has not been finalised, we anticipate that removal of the existing linkspan at Tiree and installation of a newly fabricated replacement will take place in spring 2020, and that the project will take around three to four weeks to complete. If we can reduce that timescale, we will, but it will depend upon various factors, such as prevailing weather and repair works that may need to be undertaken once the existing linkspan is removed. Brian Sydney, senior civil engineer at CMAL said:“The linkspan decks at the two ferry terminals are reaching the end of their serviceable life and are being replaced as part of our ongoing programme of harbour upgrades and improvements. We expect each replacement will require a port closure period of three to four weeks to complete the works, subject to weather conditions. If we can reduce the timescale, we will. We know that timing and connectivity is vital for the islands and our aim is to minimise disruption as far as possible. The primary concern is what Tiree ferry transport links will be impacted during the linkspan replacement period? TCC has asked CalMac a series of questions, in this regard, and has requested CalMac to respond by TCC’s next meeting (Feb). A&BC decided in Feb 2018 to reduce its subsidy to £512,207pa for the new tender period ie 2019-2022. This was a reduction from £720,756 pa from the previous tender period . Argyll Air Services were put out to tender in Sept 2018. When the tender closed two months later (Nov), only one submission was received. It was rejected, being deemed non-compliant. 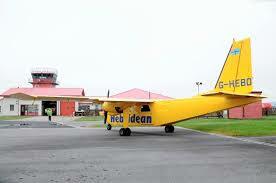 This sole bid was from the current service provider, HebAIR. TCC /TTF has not been informed as to the reason(s) HebAIR bid was rejected ,but can only assume the reduced subsidy was a significant factor. In the interim period A&BC has considered options to move forward. After intense lobbying, jointly from Coll,Colonsay and Tiree Commmunity Councils, the Policy and Resources Committee(PAR), at its most recent meeting decided to re-tender the tender, but under EU tender rules, any resulting positive tender award can only re-commence services from 28 June 2019. 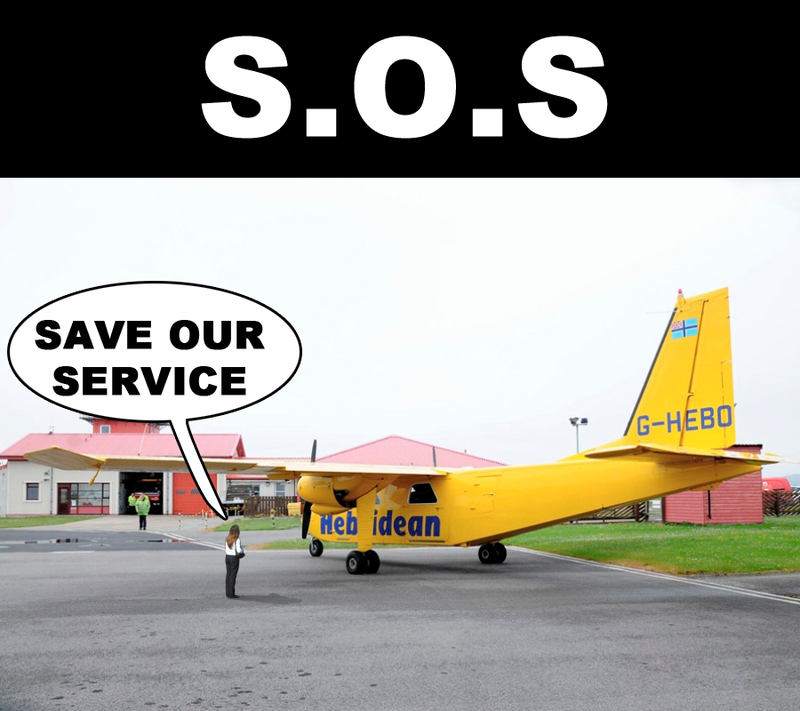 It is unclear, at this stage, what the re-tender will specify , but Tiree has to anticipate that air services to Oban may cease as of 15 May 2019. TCC/TTF has submitted the letter below to all parties ,incl Mike Russell MSP ,and hopes for a positive outcome from this re-tender to ensure a prompt re-commencement of Oban air services. We were obviously relieved to hear last week that the Policy and Resources Committee (PAR)decided to re-tender for the Argyll Air Service. We do appreciate the considerable sums that Argyll and Bute Council have spent over the last decade, both on the PSO itself and the running of three airports. We on Tiree place an extremely high value on this service for the reasons set out in our joint letter to the PAR Committee. 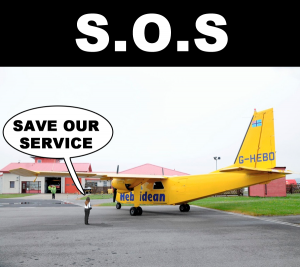 Clearly, it would be a major step backwards if an island group such as the Inner Hebrides did not have an air service connecting it to its regional hub. We are committed to restoring the service as soon as possible after it lapses on 15 May 2019. Our concern now, however, is that simply sending out exactly the same tender documents to the same airlines will result in the same answer: no compliant submissions to the tender. Our feeling now is that Argyll and Bute Council should introduce additional flexibility into the second tender document to allow any potential operator to make a value for money bid, based upon their own operating and cost centre criteria. This would maximise the chances of retaining a renewed Argyll Air Service within the financial constraints agreed by the Council for the next three years. 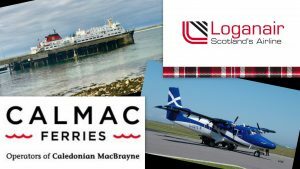 As part of this flexibility, one proposal that you might want to consider is switching the Oban-Tiree service to a commercial basis route. On this basis, Oban-Tiree would come out of the PSO and operate in much the same way that Hebridean Air Services currently operates the Oban-Islay route. Our understanding is that passenger figures and profiles are broadly similar on the Tiree and Islay routes. We have to say that we have been disappointed over the last two weeks by the lack of information and consultation that our community’s representatives have received from elected Council members and officials. We do understand the principles of commercial confidentiality, but we do not think we should be receiving almost all of our news from the media. We would certainly be interested to see a copy of the new tender document.